Grew up… in WhoVille, where he was delivered to by mistake. Adopted and raised by two elderly sisters, he was ridiculed as a child by others in his class, especially when his attempt to shave his chin resulted in numerous cuts. He then ran away to the isolation of the lonely mountain overlooking WhoVille. Living… in a cave high atop Mt. Crumpit with his only friend in the world, his dog, Max. There he stews over his hatred of the Whos and Christmas. However, when a young Who, Cindy Lou, hears his story, she invites him to be the main participant of the town's Whobilation celebration. At first he rejects her, but then he reviews his schedule: "4:00, wallow in self-pity; 4:30, stare into the abyss; 5:00, solve world hunger, tell no one; 5:30, jazzercize; 6:30, dinner with me - I can't cancel that again; 7:00, wrestle with my self-loathing... I'm booked." Eventually, he decides he can make room for Whobilation after all. Profession… prankster, and burglar. 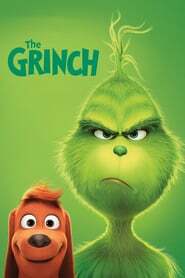 He is almost convinced to celebrate Christmas with the Whos, when the town's bullying Mayor who picked on the Grinch in his youth not only asks the Grinch's childhood crush to marry him, but he gives the Grinch a cruel joke of a gift: an electric shaver. Interests… ruining Christmas. After the embarrassing fiasco with the electric shaver, the Grinch reverts back to his terrorizing ways. He ends up ruining the pre-Christmas event of Whobilation as a result. Relationship Status… single and alone, but in love with Martha May Whovier since childhood. Unfortunately WhoVille’s Mayor, Augustus May Who, is in love with her too. Challenge… trying to stop Christmas from happening. He eventually manages to burglarize all of WhoVille by dressing up as Santa and stealing everyone's Christmas gifts. But when he sees (and hears) the Whos’ triumphant singing, he has a change of heart. In fact, it grows three times its normal size. Personality… mean, bitter, and somewhat maniacal. Yes, the Grinch had a rough childhood, but that’s not reason enough to be such a misanthrope. But when offered a true chance at redemption by the kind Cindy Lou and some of the better-natured Whos, will the Grinch take it? The Grinch's popularity ranking on CharacTour is #1179 out of 5,000+ characters. See our top-ranked characters and read their profiles.